HOUSTON, TX--(Marketwired - June 15, 2015) - On July 18-19, 2015, the 31st annual Bridal Extravaganza Show will be held at downtown Houston's George R. Brown Convention Center. A citywide search was conducted for the next Houston area bride to appear on billboards. The winner is Sarah Carruth. 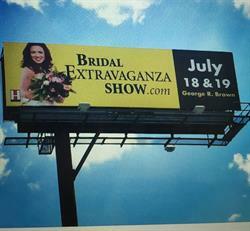 She appears on billboards citywide to promote the upcoming Bridal Extravaganza Show. Sarah is a graduate of Texas A&M University and works as an engineer. Sarah and her mother attended the Bridal Extravaganza in Houston looking for wedding ideas. "We feel grateful to have resources in Houston, like the Bridal Extravaganza. I saw the billboards the week after we got engaged and was so ecstatic to go look for inspiration." Now Sarah is the Billboard Bride and her image will grace giant billboards throughout the Greater Houston area, inviting lucky brides-to-be to the George R. Brown Convention Center to enjoy two full days of wedding inspiration. Billboard bride sponsors include: Ventura's Bridal, ANA&IVAN photography, Edward Sanchez Cosmetics, Heather Benge Events, F. Dellit Designs, House of Hough, Edible Designs by Jessie, My Urban Invites, and Butler's Courtyard. The opportunity to appear on billboards is open to all Houston area brides in attendance at the July event. Complete information is available at www.BridalExtravaganzaShow.com and www.billboardbride.com. At the Bridal Extravaganza Show, thousands of brides, bridesmaids, mothers-of-the-bride, grooms, and wedding planners have their pick of over 345 vendors in 700 display showcases who cater exclusively to the ever fashionable, stylish, and romantic wedding industry. This huge event, held twice annually, draws marriage bound couples from all over Texas and beyond to find invaluable resources and to register to win honeymoons and shopping sprees. Brides may walk away with a honeymoon in the Riviera Maya, or a free wedding announcement in Texas Weddings Magazine. From cakes to stationery, from DJs to live music, from gowns to catering, this is the event brides plan to attend. Brides also enjoy formal fashion shows presented on the 60-foot New York style runway. Best of all, brides can interview Houston's most trusted vendors and make selections.